Cats are notorious for scratching up furniture, walls, and carpets (which my cats seem particularly fond of). Felines also love hiding in small, dark places, which can get them into trouble if they choose the wrong place to hide. Luckily though, these problems are pretty easy to fix with a high-quality cat condo. Cat condos are wonderful because they give your feline friend somewhere to spend their time and sharpen their claws without getting into something they shouldn’t. We reviewed dozens of cat condos to identify the best of the best. We considered each product’s size, construction, number of posts, amount of resting spots, included toys, stability, durability, and customer reviews. Whether you’re a multi-cat household or only have one beloved feline, this cat condo is for you. After some deliberation, the Go Pet Club 62-Inch Cat Tree came on top as the clear winner. This cat condo features quite a few hiding holes that both large and small cats can effectively use and was described as extremely durable by many different customers. Out of all the cat condos we reviewed, the Go Pet Club 62-Inch Cat Tree came out on top. It stands at 62 inches tall but is decently inexpensive for its quality and size. Featuring a wide range of different perches, this cat condo comes with a place for every cat to sit – no matter their personality and size. It comes with a hammock, basket, traditional “hiding hole,” and tunnel. Some customers stated that their cats loved certain perches better than others, which is to be expected. This cat condo also comes with quite a few places for your cat to scratch. There are three different scratching posts on the bottom level and three on the upper levels. The whole condo is also covered in carpet, so your cats can scratch in a wide variety of places. To encourage exercise, this cat condo comes with a built-in rope toy, a sneaky hole for your cats to jump out of, and a ladder. Exercise is necessary for your cat to stay happy and healthy, so it is important to choose a cat condo that can fulfill this function. You will have to assemble this product yourself like many cat condos. However, many customers described the assembly as easy and effortless. The instructions are easy to follow and the process pretty straightforward. It is very important that you read and follow the instructions though. If you screw some of the supporting screws in too far, it can result in a wobbly cat condo. 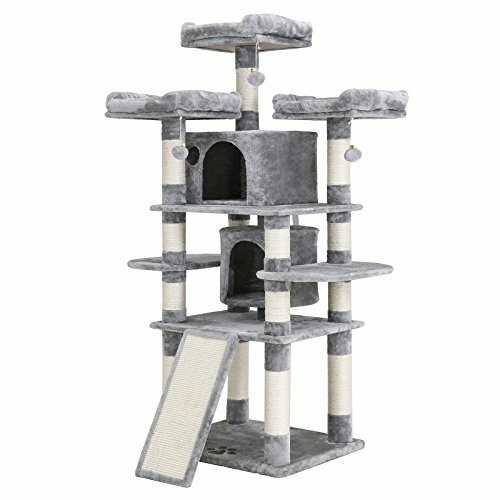 If you’re looking to really go all-out on a cat condo, then the BEWISHOME Cat Tree Condo is perfect for you. 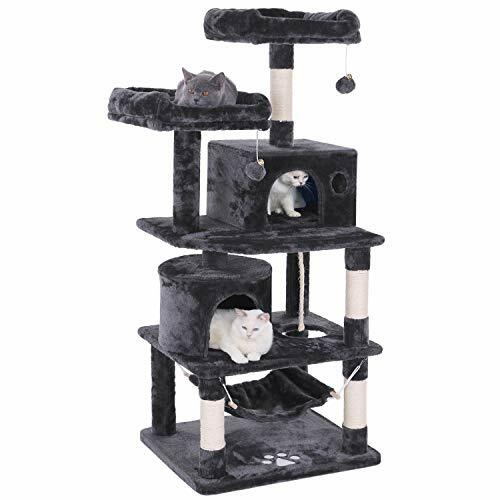 The BEWISHOME Cat Tree Condo is nearly as tall as our top pick at 57 inches, but it is designed with larger perches, making it more suitable for those who have larger cats. It features two cushioned and large platforms with slightly raised edges for those cats the prefer to sleep out in the open. Two spacious hideaway houses provide a large amount of lounging space, even for big cats. A cozy hammock hangs at the bottom level for sleep or play, and interactive bells and twine offer play opportunities. The whole structure is covered with a soft fabric, and there are four scratching posts scattered around the condo. The whole condo is built with durability in mind. The whole thing is well-balanced and designed for heavy use. You don’t have to worry about your cats tipping it over or pieces breaking off. The plush fabric the condo is covered with is soft and inviting. However, some customers did report that their cat did not enjoy the fabric, so that is something to keep in mind if your cat is only used to rougher materials. While this one needs to be assembled as well, the process is pretty easy and straightforward. The darker look resembles high-quality furniture, which gives the whole condo a more upscale look. For those looking for something a little simpler. If you just need a simpler cat condo for an apartment or other areas where your cat needs her own space for some alone time, then the Kitty City Large Cat Cube might be for you. This shorter cat condo stands at less than 20 inches tall, but it’s also stackable if you have multiple cats or your solo cat likes to have more hideaway options. 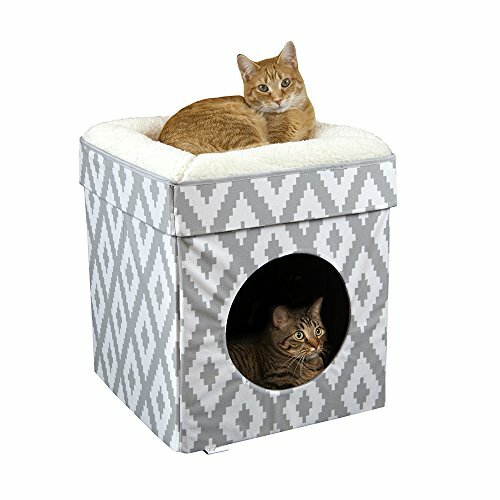 A cozy napping pad and private kitty lair in one, it has fabric side walls for the ultimate in comfort and coziness that create a sturdy perch for your favorite feline. If you don’t have much room to spare for a cat condo, this might be an option. It features a comfortable, plush fur lounging bed and an interior fleece bed, both of which are machine-washable, plus a large opening to allow even plump kitties easy access. It measures 16.5 inches wide by 16.5 inches deep, making it a compact option for apartments and other smaller spaces. And while its decorative, grey-and-white design makes for a neutral complement to any decor, the walls also fold flat for convenient storage when you need to tuck it out of sight. Perfect for those with large cat households. Most cat condos are designed only to be used by a few average-sized cats. If your cats are larger than that or you just have a lot of feline friends, you’re going to need something larger than what most cat condos offer. Luckily, the FEANDREA 67” Multi-Level Cat Tree can provide your cats with plenty of room to play and nap. It comes with multiple layers, two roomy houses, and three raised perches. Many of the legs are covered in sisal to encourage scratching and improve durability. Three balls hang from the perches to tempt your cats and inspire plenty of exercise. This cat condo is constructed with CARB-certified particle boards and battens at the bottom in ensure maximum stability. It also comes with anti-toppling fittings for a little extra security. While many of our other top picks aren’t suitable for very large cats, this one should fit all sizes of cats just fine. Many customers were surprised by just how large this cat condo was, so we recommend measuring your space before ordering to ensure that you have enough room for it. If you have multiple big cats, then this is probably your best option. Designed for those sun-loving felines. Most cats love to be outside, but it is often not safe for them to wander around the great outdoors alone. An outdoor cat condo can give them the outdoor experience they long for while also keeping them safe from predators, cars, and hazardous materials. Prevue Pet Products Premium is a wonderful option for an outdoor cat condo. It has no gaps to let your cat escape or pinch points. The heavy-duty, aluminum construction is rust-resistant and strong enough to withstand a decent amount of punishment. This cat condo comes with two snap-in platforms and a hammock, providing elevated places for your feline to safely rest. The cage is accessible through two large doors and is lightweight enough to move around easily. Many customers were surprised at how sturdy this cage was, especially with its lightweight design. However, it is complicated to assemble and takes more time than our other listings. The cage is also not designed for indoor use. While some customers do leave it indoors, the bottom of the cage does not sit well on carpet, and the wheel locks can scratch sensitive floorings. This is an outdoor cage and should really only be used as such. Anyone who has a cat should seriously consider investing in a high-quality cat tree. Cats rely on vertical mobility for comfort and fun; they would much rather be up high than on the ground. Cats feel safer when they have the ability to move up and down, which can prevent fighting in multiple-cat households and help timid cats feel confident. When a cat has the ability to hide in a cozy cat house or scale a cat tree, they are much more likely to be equipped to appropriately deal with stressful situation. A cat window perch can also help in this manner, but usually does not have the hiding hole a cat condo does. Of course, as you’ve probably noticed, cats are going to climb whether you give them a cat condo or not. They’re going to jump on your bathroom sink, climb your furniture, and even find a way on top of your cabinets. However, it is not uncommon for cats to injure themselves when they climb on things they shouldn’t. Accidentally leaving medicine out on the counter can be deadly for a cat who jumps on the counter to escape the dog – not to mention the damage your cat’s climbing can have on your furniture. Providing your cat with a safe, appropriately place to climb can be good for both you and them. Size. This is perhaps the most important consideration you need to make when purchasing your cat condo. On the one hand, bigger is better for your cat, but on the other hand, you might not have room in your house for a giant cat condo or even necessarily need one. If you have multiple cats, you are going to need to purchase a larger cat condo than someone who only has one cat. Similarly, if your cats are larger than you’re also going to need to purchase a larger cat condo. Material. There is a large variety of materials cat condos can be made out of, and some are obviously going to be high-quality than others. Some cat condos are made out of flimsy cardboard and glue, which aren’t necessarily going to hold up very well. Other cat condos are made out of particle board and screws. In general, you want to aim to purchase a cat condo that is made out of better materials. While these high-quality cat condos are going to be expensive, they will save you money in the long run. Stable. Stability is vital for a well-designed cat condo. If your cat condo isn’t stable, there is a risk that it could topple over, possibly injuring your cat or breaking something. Cat condos with larger bases are going to be more stable than those with small bases. The quality of the screws and size of the legs also have quite a bit to do with stability. When in doubt, we recommend checking customer reviews. Aesthetic. If you’re going to place your cat condo in a regularly trafficked area, how good the cat condo looks is going to be important. While your cat probably won’t care what their cat tree looks like, no one wants to spend money on something that is going to be an eyesore – even if it is practical. Scratching posts. All cat condos are going to have some sort of scratching posts, but they’re going to vary in quality and quantity from cat condo to cat condo. If your cat is a big scratcher, we recommend choosing one with as many scratching posts as possible. It is also important for each scratching post to be covered in a tough material that will prevent your cat from shredding it. Toys. A good cat condo will not only give your cat a place to climb and sleep, but also a place to play and exercise. Older cats often need a little inspiration to play, so getting a cat condo with built-in toys is vital. These toys should also be decently durable to prevent your cat from destroying them in one play session. You should also invest in a few cat toys to spread around your house and the cat condo. A cat condo is a structure that is designed for cats to climb, sleep in, scratch, and play. They meet many of your cat’s needs and are often intended to withstand your cat’s claws and frisky behavior – unlike your couch. Many cat condos are a combination of scratching posts, cat houses, hammocks, and toys. Do cats actually use cat condos? Just like humans, cats have their own preferences. Not all cats are going to be in love with the idea of a cat condo and might prefer to hide under your bed than in a cozy cat house. At the same time, some cats are going to want to spend all their time at the cat condo. Generally, once a cat realizes how fun and secure the cat condo is, they will use it at least a little bit. There are also a couple of ways you can encourage your cat to use a cat condo. How do you get a cat to use a cat condo? Every at is probably going to be a little unsure of the cat condo when you first get it. This is normal; give your cat time to warm up to the condo. You can use treats, toys, and catnip to entice your cat onto the tree if they seem particularly unsure. We recommend placing treats and catnip around the various levels of the cat condo and letting your cat discover them. Playing with your cat near the cat condo and enticing them to climb to get a favorite toy is also a great option, especially for playful kitties. When your cat spends time on the condo, praise her, but also remember that the condo is your cat’s safe place. Don’t pester your cat or do something they don’t like (like grooming, for example) while they’re on the cat condo or they might begin avoiding it. How big are the entry holes in a cat condo? This varies from cat condo to cat condo. Some are going to have small entry holes, while others are going to be very large. When selecting a cat condo, remember that your cat can probably fit into smaller spaces than you think. The cat houses on a cat condo are designed for hiding, so the entry holes will likely be small to make your cat feel safe and secure. We looked at 20 other condos for cats. Even though they didn’t make our 5 best cat condos list, they’re the best of the rest and each is still a great option for your cat. The information you’ll need to compare each one is included with the listing. For even more similar products, check out our review of the best cat trees. Don’t want to risk your feline companions running away? This enclosed structure gives them enough room to run and play whether you are enjoying the outdoors with them or just need them to get a breath of fresh air while you stay inside. A practical, no-frills space for up to 3 cats, this house has a removable top and insulation for easy cleaning, as well as a vapor barrier to reduce condensation. It also has a removable flap for the unique door that prevents predators from getting into your cats home away from home. Whether you have an outdoor cat you wish you could bring inside, or your favorite feline loves to spend time outside, this weatherproof house will make them feel right at home. It is made of cedar wood, which is an anti-rot material and will last for at least 3 years in tough outdoor conditions. When it comes to style, it is hard to beat this cat condo by Petsfit. It is constructed out of solid wood and is designed to accommodate up to five cats. This getaway is ideal if you have a cat that likes to sneak away but always comes back (especially if you’re not home, or already in bed), or if there is a special stray cat you can’t help but to care for. If placed under a covered porch or deck, they will stay warm and cozy even in unfavorable weather conditions. A well-balanced space for your home as well as both small and large cats. It even comes with catnip spray to help your felines warm up to it faster. Customers love the fact that this tree can accommodate both their large and small cats. While the structure is minimal, there is still plenty of room for cats of all sizes to climb and leap. This fun design allows you to custom-build a space for your favorite feline no matter their size or age. Keep it close to the ground or build it up, they have something to explore and play with either way! 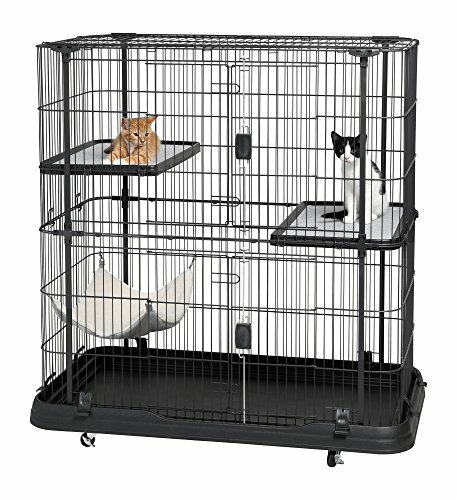 If you’re looking for a sleek yet sturdy structure that is pleasing to both you and your cat, look no further! Although a bit pricey, the design and features of this tower are well worth the cost. The subtle design of this tower will let it blend in comfortably into any room of your home while also letting your cat have a place to play and rest. Whether you have a full-grown feline or a kitten that is energetic and curious, they will find their happy place playing and lounging in this moderately-sized cat home. Designed for up to 32 pounds of weight, this unique cat tree is strong enough to hold even the biggest cats. If your cat loves to cuddle, as many of them do, the faux fur that covers this sturdy tree will provide them with great comfort whether they are nestled in the clubhouse or playing with the built-in springy ball wand. If you don’t mind giving up some floor space in your home for your beloved friends, then this pick may suit you well. 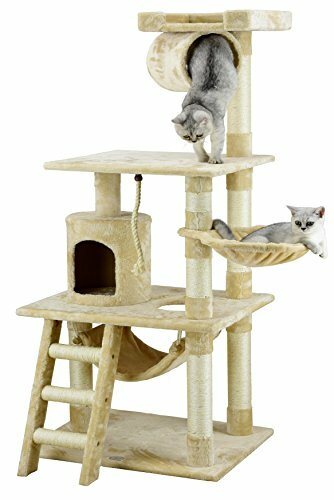 With 15 different levels to climb, perch, and lay, this very tall yet sturdy loft can accommodate cats of many sizes and energy levels. For the price, this tower is an excellent find. With the extra stability, you can rest assured knowing that all of your cats, no matter their size, will be able to play and rest comfortably and securely. Although small in size, this cozy home has a place for any size feline. The widened top perch is just the right size for bigger cats to relax while the base gives smaller cats a chance to jump, nap, and play. With its small size for easy accessibility and 2 different kinds of scratching posts, this is an optimal first home for a new kitten. The Midwest Curious Cat Cube features brown faux suede and synthetic sheepskin to appeal to your cat’s curious senses, plus it has a plush hanging ball and hide-and-seek cut-outs to promote play. The Original Ziggy DEN Cat Hideout comes in brown or grey suede to match any decor. Made from soft, yet durable materials, it’s easy to clean by wiping up any messes with a rag. Plus, it connects with Easyology Cat Tunnels to create a fun maze for your favorite feline. This structure is perfect if you have a kitten or smaller size cat and/or you have limited space in your home for a place of their own. It also folds shut for easy storage or if you plan on traveling with them!